This Place of Worship was founded in 1852, but we understand it was closed in 1932. Highbury Congregational Church, built in 1852, stood on the corner of Winchcombe Street and Albion Street. It was designed by Samuel Onley as a replacement for Highbury Chapel (formerly 'Snow's Chapel') in Grosvenor Street, which had become too small. Its congregation were led by the charismatic Dr Andrew MORTON BROWN, said to be the leading non-conformist minister in the town and a very strong Liberal. He remained pastor of the Church until July 1879, when he retired due to ill health. He died shortly after at Bridport, Dorset, aged 67 ("the sixty-eighth year of his age". "Half a million bricks, 300 tons of steel - and all of it British - will be used in building Cheltenham's new super-cinema', enthused the Chronicle" of the Gaumont's construction. 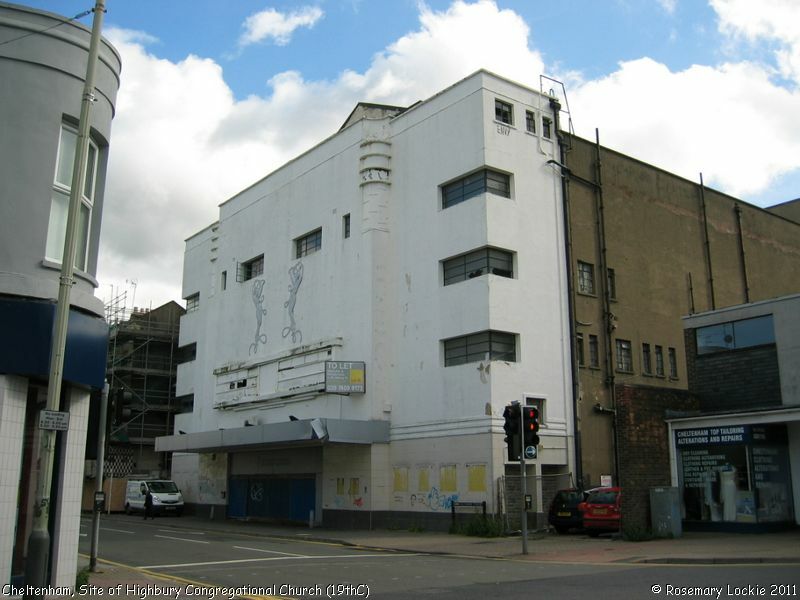 The Gaumont subsequently became the Odeon Cinema, which in turn closed, and as can be seen on our photograph, the premises are now (2011) awaiting redevelopment. Highbury Congregational Church (19thC) (Demolished), Cheltenham shown on a Google Map. Information last updated on 16 Nov 2018 at 14:03. This Report was created 28 Mar 2019 - 16:35:06 GMT from information held in the Gloucestershire section of the Places of Worship Database. This was last updated on 7 Feb 2019 at 07:45.